In a previous blog (11 Ajaw 3 Muwan, January 10, 2013), we reported on two events in Cobán, Alta Verapaz, Guatemala, organized by Marina Rosales, Yudy Mo’ Isem, and Mario Sebastián Caal Jucub, all participants at the 2012 Congreso in Valladolid. The response to these two workshops was so powerful that they organized a third event, which we bring to you here. Strengthen Maya identity by taking ownership of ancient Maya writing; for teachers and specialists that work in education within the Maya communities. The opening prayer of the Third Cobán Event of December 4 and 5, 2012. 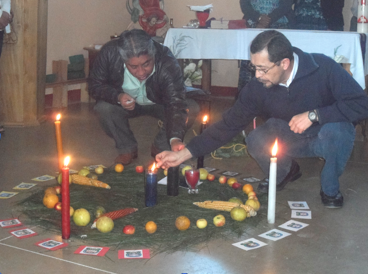 The ceremony was intercultural (Maya-Catholic). Our long-time friend and colleague has been recognized in his own country for his life-time achievements in strengthening Maya culture. We are proud to be part of this achievement. MAM (formerly Friends of the Maya) sponsored many visits by Crisanto to the Maya Meetings in Texas, and Crisanto was co-organizer of our hugely successful Congreso de Epigrafistas Mayas held in Valldolid, Yucatan, in 2012. Below are excerpts from the local press coverage of this event and links to read the entire articles. El Lic. 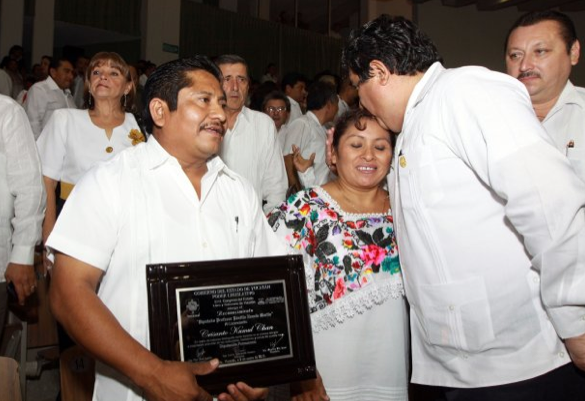 Crisanto Kumul Chan, recibió la medalla “Pánfilo Novelo Martín”, en el Congreso del Estado, hoy miércoles 9 de enero de 2013.